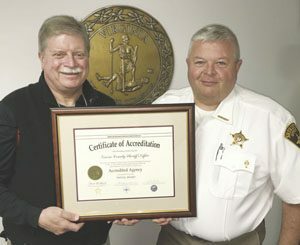 The Greene County Sheriff’s Office is among an elite group of law enforcement agencies having earned accreditation by the Virginia Law Enforcement Professional Standards Commission (VLEPSC). Accreditation is considered perhaps the best measure of professionalism among law enforcement agencies.The Virginia Sheriff’s Association and the Virginia Association of Chiefs of Police make up the VLEPSC. Executive board members consisting of active Sheriffs and Chiefs of Police established 180 professional standards and administer the accreditation process by which Virginia agencies can be systematically measured, evaluated, and updated. The program is independent of state government; however, the Virginia Department of Criminal Justice Services manages day-to-day operations for the Commission. Sheriff Steve Smith (right) and Deputy Mike Martin display the Sheriff’s Office certificate of accreditation. On-site assessments are conducted by specially trained program assessors to review the professionalism, quality, and consistency of the agency’s operations and assure full compliance with all of the standards of the program. The Greene County Sheriff’s Office became an accredited agency on May 11, 2016. The announcement was made by the Virginia Law Enforcement Professional Standards Commission (VLEPSC). Once every four years, accredited agencies must go through a re-assessment to make sure that agencies are following the standards set forth by the commission.